Back from Brazil comes the Useful Simple Trust’s “Mr Sustainable”, Dan Epstein, with someone’s masterplan for us to review. It’s all rectangular, glass, no sense of place, sterility without redemption. “Absurd” is how our urban designer describes it. 2,000 years after Rome, 160 years after Haussmann, 40 years after Gaia, has our BRIC-ish masterplanner learned absolutely nothing? For there’s no plan, and we can’t detect a “master”. It’s a sadly familiar scenario. His design is ignorant of everything good that’s gone before yet we are asked to review its incompetence. Extinct before it’s born, it doesn’t need a review. It needs divine intervention. I’m not being mean, I just don’t want our industry to produce such ignorant rubbish, especially for developing countries who trust us to do better than they can. “If you judge a fish by its ability to climb a tree, it will live its whole life believing that it is stupid”, said Einstein. But sometimes it’s very smart to be “stupid”. For example, when its world evaporates, even a fish might try to climb that tree. Desperate times, with such desperate designs, we too might need desperate measures. “So, who’d like to be first up?”, gasp the fishes in their muddy pool. Only the bravest, or possibly most stupid come forward. The first few die horribly on the bank. Nothing to eat, no shelter, nothing to breathe, at least it’s quick. But eventually one remarkable fish does figure out how to clamber out and live. As for the rest, science confirms they become very good fossils……. I mention the fish because their world is our world. Stick or twist? Stay or move? Most projects have some strong “swimmers” diligently cruising up and down the pond. Bobbing around are others still in their waterwings. If they are all careful no-one drowns. Some even realise the pond is shrinking yet they won’t, or can’t, climb out. Just a few quit swimming and try something new. These “tree-climbers” develop an entirely fresh perspective. In our lives, let’s say Renzo Piano is one. Or lately, Steve Jobs. There once was Newton. Einstein himself. But even these great minds were once just babies, complete novices. They couldn’t climb anything at first, but eventually found a way forward, leaving their origins far behind. The “pond”, with all its problems, seems completely different once viewed from outside. As an example of perspective change, four years ago I photographed our sister galaxy Andromeda from my garden. Glowing huge on the computer, two million light years away, it was mysterious, unfathomable. As a novice, I was amazed at my achievement. But with practice, I’ve taken another picture every year, and gradually that first one seems less wonderful. Each new shot has more colour, more texture, more subtlety. Last week I took the fourth version, and suddenly, I noticed that Andromeda wasn’t alone up there. Nearby in the darkness glowed another galaxy. Only 10 billion suns, pretty hard to miss you’d imagine, called Messier 110. 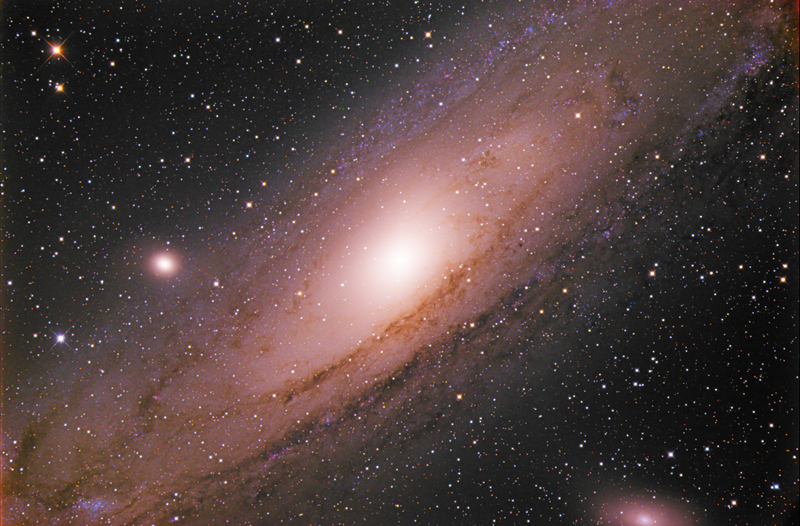 I’m sure it was there before, but now I felt a sort of outer body experience… in my mind I was up there far far away near Andromeda. A moment later I was back home, a grey February, wondering about dinner. The perspective-shift was so strong that I was nearly travel sick, even though the entire journey was inside my head. But after 4 years’ effort I was suddenly enlightened. I mention this little story because of its resonance with a working life in design. Try try try again….eventually there’s a concept and a collective sigh of relief. And too often, there it rests, at novice level, just as that first astrophoto in which for 4 years I couldn’t see 10 billion suns even though they shone right in my face. In the BRICC plan we see the hand of a novice, and the thrill of achievement blinds him and most involved. Masterplan? We hope for mastery lost in the glare, or at least proficiency, when all we have is a novice-doodle. The importance of mastery was explained back in 1980 by Stuart and Hubert Dreyfus of the University of California who developed a five stage model of the way in which we learn. The stages are Novice: Competence: Proficiency: Expertise and Mastery. Compare our BRIC novice with a “master” like Piano, who according to the Dreyfi is “capable of experiencing moments of intense absorption in his work, during which his performance transcends even its usual high level”. I’d add that Piano’s performance transcends even its usual intellectual location, and that is key. Every so often, someone like Renzo can look at the world from Andromeda. A special skill we could all do with. And for that we can thank the tree-climbing fish. If you spot one, please feed it.